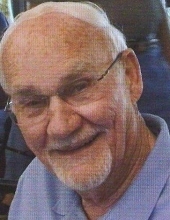 Robert A. Snyder, Age 90 of Rochester Hills. Loving husband of the late Catherine. Dear father of Arlene (Thomas) Corace, Christopher Snyder, Linda (Gary) Mayer, Edward (Cheri) Snyder, Loretta (Keith) Frye, and Paul (Karine) Snyder. Grandfather of James (Nicole), Justin (Imo), Jessica (RJ), Matthew (Amelia), Pamela (Rafael), Robert, Max, Melissa (Andre), Michael, Michelle, and Sebastien. Great grandfather of Elijah, Emaline, Alice, Ariel, Jackson, Fiona, Amadeus, Penelope, Zelda, and Nadia. Brother of Gerald (Ruth) Snyder, and the late Earl, Marvin, Nellie Mae, and Dorothy. Funeral Mass Friday, April 26, 2019 - 10:30 a.m. with an in-state at 10 a.m. at St. Joseph Catholic Church, 715 N. Lapeer Rd., Lake Orion. Luncheon immediately following mass. The family will receive friends Thursday 3 to 8 p.m. with a 7 p.m. Rosary at Modetz Funeral Home, 100 E. Silverbell Rd., Orion. Private entombment will take place at Resurrection Cemetery, Clinton Township. In lieu of flowers, suggested memorials may be made to Planetary Society (www.planetary.org) or masses in honor of Robert. "Email Address" would like to share the life celebration of Robert Alonzo Snyder. Click on the "link" to go to share a favorite memory or leave a condolence message for the family.